To begin, chose your desired coin size and then select how many hands you want to play. You can play a single hand, 5, 10, 25 or 50 hands and each hand costs you your selected coin size. But remember, the fewer hands you pick the higher the maximum coin size gets so make sure you get the balance right. To begin, click Play. The cards will be dealt and your stake money will be deducted from your account. 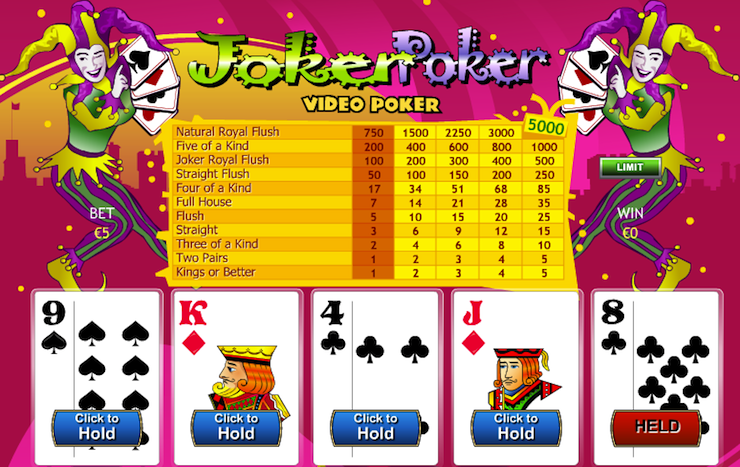 The aim of Video Poker is to produce as many winning hands as possible by keeping the most useful cards from your original hand to help all the others. Simply click on a card to hold it across all your other hands. Clicking a card again will take the hold off. When you click Draw, all face down cards will turn and your winnings will be counted. You can also control the speed that cards are revealed by turning the Turbo feature on or off. Winning payouts will be credited to your account instantly. Winning combinations include: 5 aces, Royal Flush, Straight Flush, Four of King, Full House, Flush, Straight, Three of King, Two Pair, One Pair.